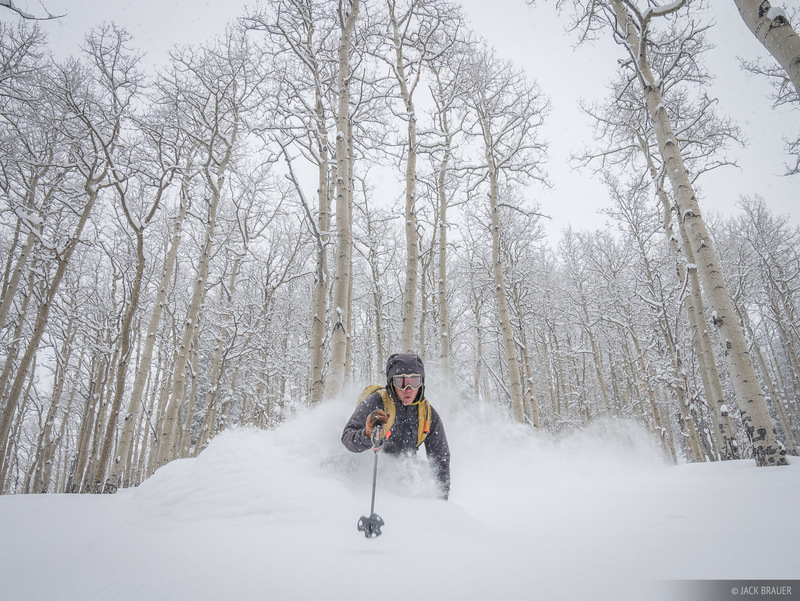 Skiing deep powder in an aspen forest – January. Skier: Don Moden. Colorado, and most of the west for that matter, has been getting pounded by a powerful winter storm these last few days. This last weekend we did a quick trip to Ouray to catch up with some friends and get out for some backcountry powder turns. Although we were both a bit sad to leave, after two great days of skiing we hightailed it through the blizzard back to Crested Butte, where two feet of powder blanketed the Butte by Monday! Posted in Colorado, Skiing/Snowboarding and tagged Colorado, Ouray, San Juans on February 1, 2016 by Jack Brauer. The town of Ouray, Colorado rockin on the Fourth of July. 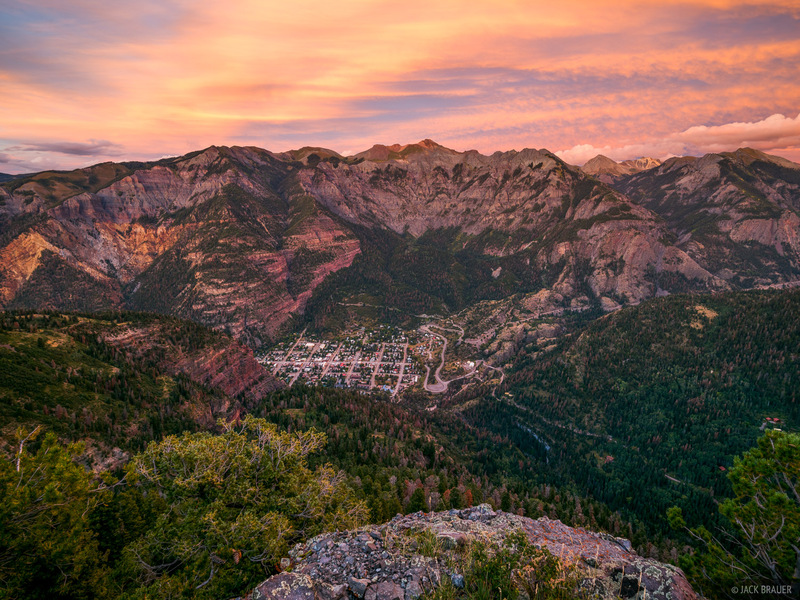 Ouray is one of the most unique places in the world to watch fireworks; each boom echoes around the mountains. The sounds of the echoes are just as awesome as the fireworks themselves! Beer, water fights, beer, barbeques, more beer, and then we sweated out all that beer with a wine hike up to our favorite terrace over Ouray to watch the fireworks. What a day!!! 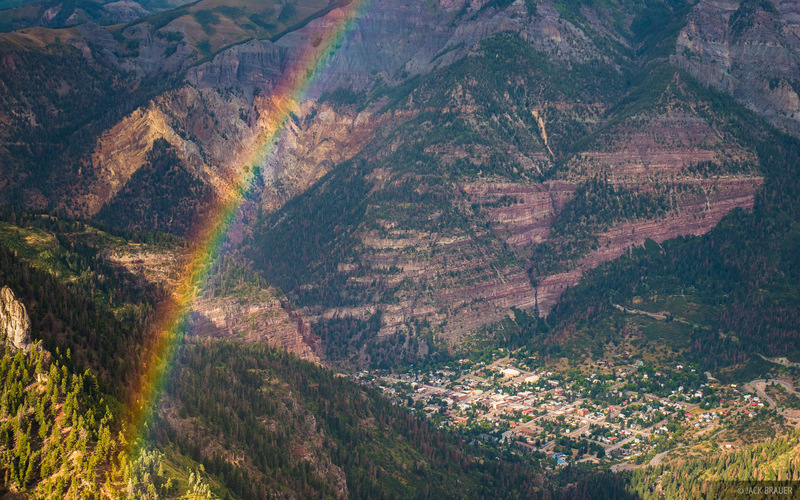 Posted in Colorado and tagged Ouray, San Juans on July 5, 2015 July 6, 2015 by Jack Brauer. On Wednesday Claudia and I went for a ski in the morning, and a wine hike in the evening! Looking at the south side of the Sneffels Range in early June. Mt. Sneffels (14,156 ft.) is just about in the center; Gilpin Peak to its left looks bigger from this perspective but only because it’s closer. Potosi Peak is off to the right, and the town of Ouray way down the right side valley. Enjoying some wine from a nice vantage point over the town of Ouray (7,792 ft.), San Juan Mountains, Colorado – June. Posted in Colorado, Skiing/Snowboarding and tagged Colorado, Ouray, San Juans, Sneffels on June 7, 2015 June 7, 2015 by Jack Brauer. 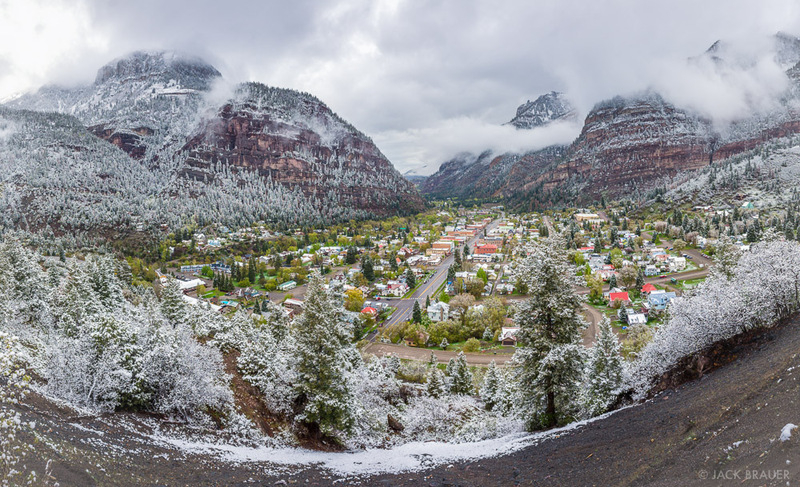 As trees bloom green in the town of Ouray, a May snowstorm cakes the surrounding mountains in powder. Couldn’t help but stop the truck and take a photo of Ouray this morning on the way to a quick lap in the powder! Posted in Colorado and tagged Colorado, Ouray, San Juans on May 10, 2015 by Jack Brauer. Almost Spring in Ouray : See it LARGER here! Late March sunset over Ouray, Colorado. 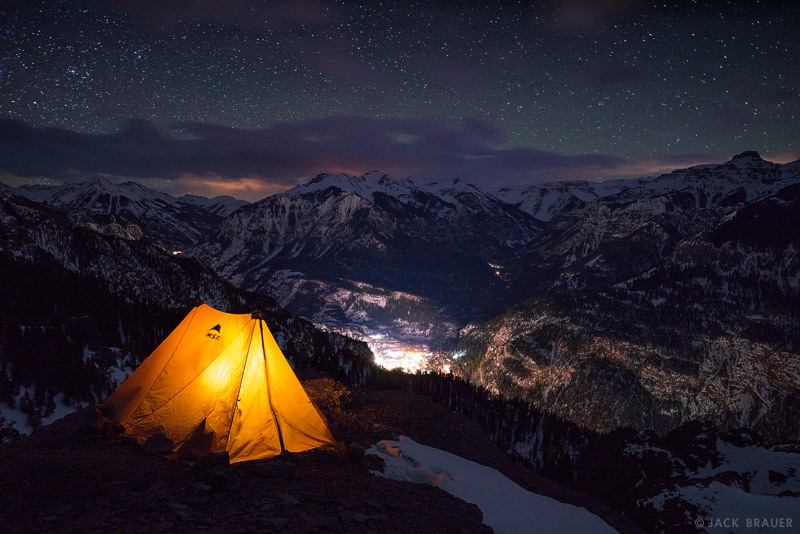 Posted in Colorado and tagged Colorado, Ouray, San Juans on March 24, 2015 April 8, 2015 by Jack Brauer. 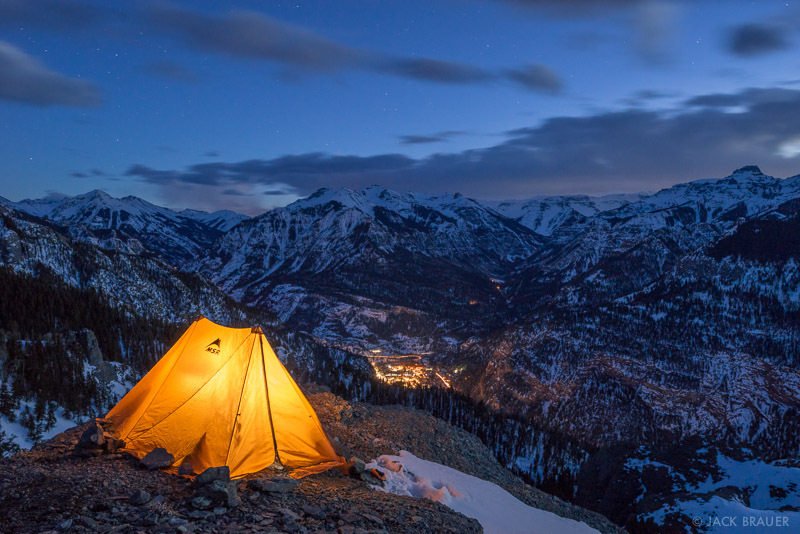 Eager to test drive a newly purchased camera, I headed out yesterday for a night of winter camping up on the “lower” Bridge of Heaven overlooking the town of Ouray, Colorado. I found a ridiculous spot to pitch my tent, right on the point of a precipitous rock outcropping! This airy perch provided a spectacular scene for tent photos, as well as an island of dry rock amongst the snow to cook and relax in ease. The morning brought a colorful sunrise along with a quick morning snowstorm before I packed up and headed back down. Thanks to Steven from Texas whose infectious enthusiasm to get out for some winter hiking ended up inspiring me to get out and make the trip! 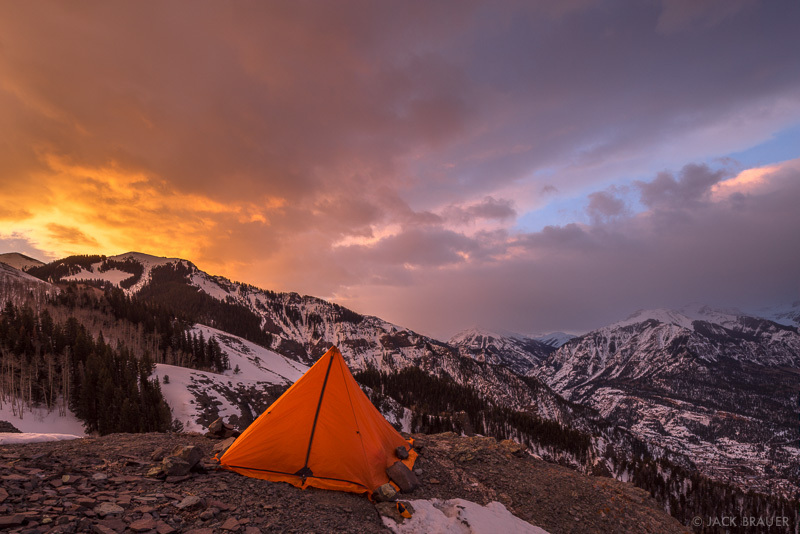 Posted in Backpacking & Trekking, Colorado and tagged Colorado, Ouray, San Juans on February 27, 2014 February 27, 2014 by Jack Brauer. The lights of Ouray, Colorado illuminate the snow-smothered mountains of the Uncompahgre Gorge, as the stars and Milky Way shine overhead after a heavy winter snowstorm – February. 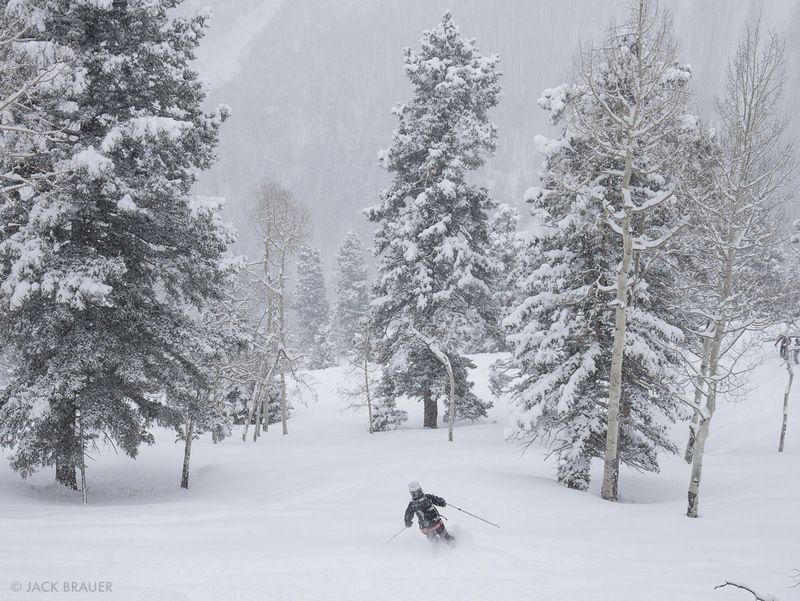 After nearly two weeks of dry sunny weather, a hefty storm rolled through Colorado on Thursday dumping over two feet of snow in the mountains! I enjoyed a stormy powder day snowboarding at Telluride on Friday, and look forward to getting out for some more powder turns soon. It seems as if the typical January dry spell is over, with several more storms are forecasted for next week! 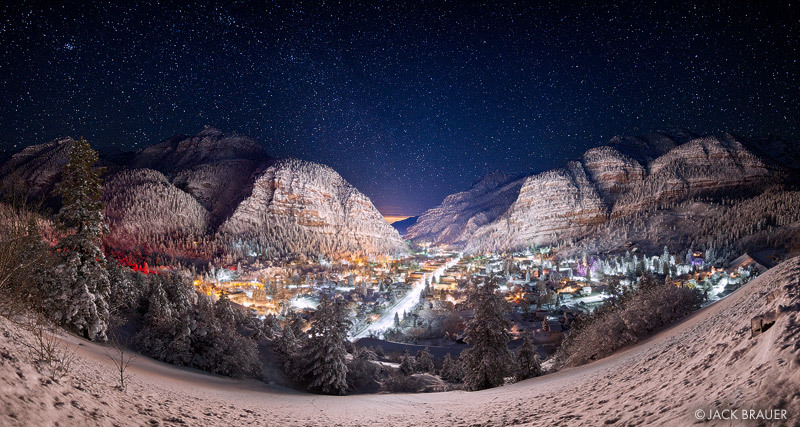 Last night the storm broke and skies cleared, so at 10:30 I bundled up and drove a little ways up the road above Ouray to shoot some photos of the stars over the snow-smothered town. 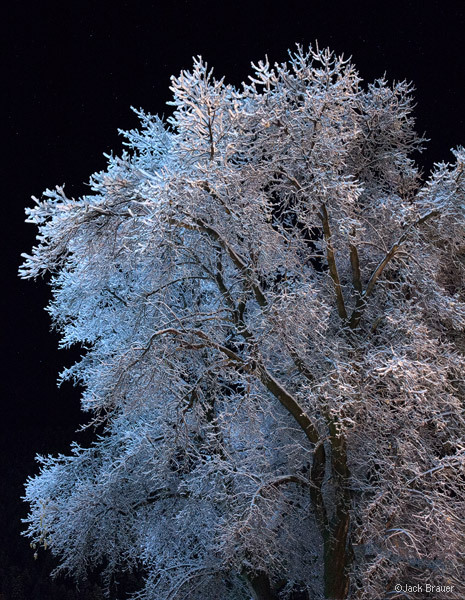 It was quite a magical scene, with perfectly calm, silent weather and everything sparkling with frosty crystals under the brilliant stars. 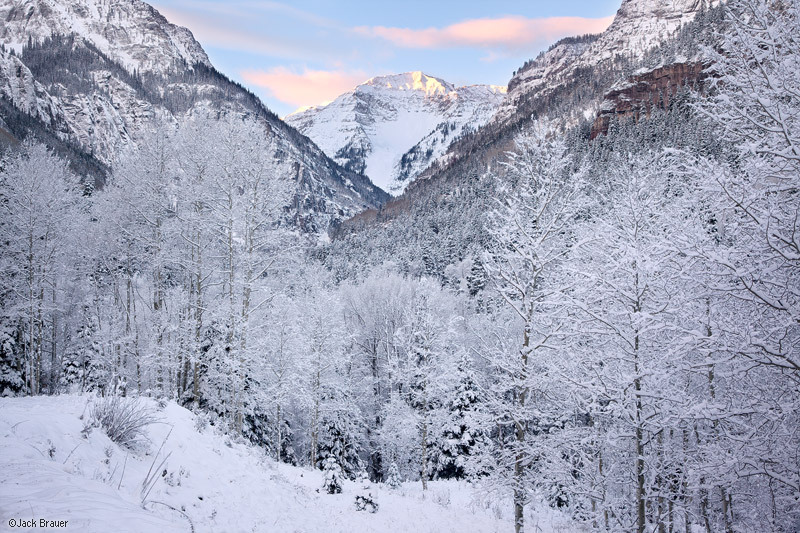 Posted in Colorado and tagged Colorado, Ouray, San Juans on February 2, 2014 February 3, 2014 by Jack Brauer. Frosty aspens and U.S. Mountain on a wintery October morning along Camp Bird Road in the Sneffels Range above Ouray. 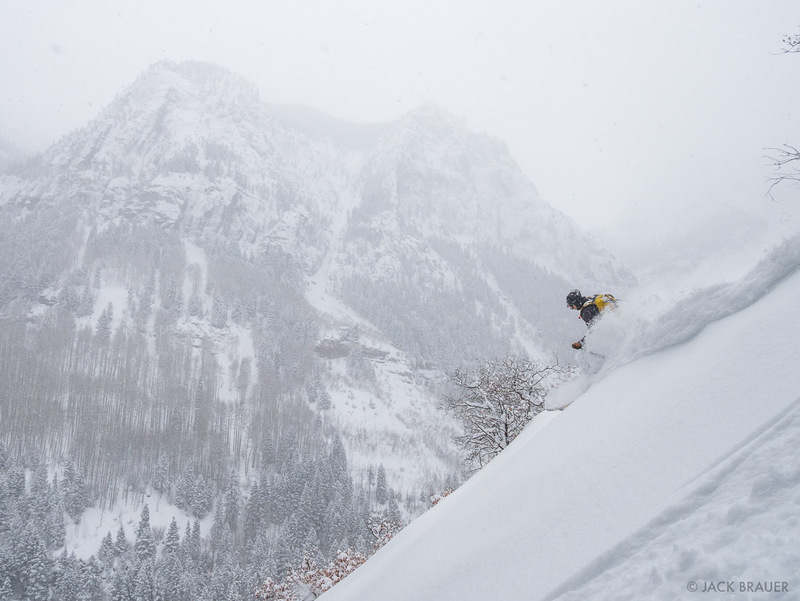 It’s been feeling a lot like mid-winter around Ouray lately, as a series of snowstorms passes through leaving everything smothered in powdery goodness! Keep it coming, please! Posted in Colorado and tagged Colorado, Ouray, San Juans on October 30, 2013 by Jack Brauer.